We are well into unit two of My Father's World Kindergarten, and J-Bug is thrilled to be learning about the moon. Unit one was all about the sun, so it naturally transitioned into this moon study. The first of many activities that I'll be sharing is a moon dust prewriting activity. I saw this moon dust sensory writing tray from The Imagination Tree, and I knew my boys would get a kick out of it. Of course, I had to put my own erupting spin on it since my kiddos are all about the baking soda and vinegar lately. Directions: To make our erupting moon dust I put one cup of baking soda in a bowl. I didn't measure the other ingredients, but I'm guessing that I used about two tablespoons each of black powdered tempura and glitter. Crushed black chalk could also be used, but I saved our last pieces of black chalk for the next project we did. I put a lid on the bowl and sealed it tightly then invited J-Bug to shake it hard to mix the ingredients. Then I spread the moon dust onto a cookie sheet and invited him outside for a simple prewriting activity. 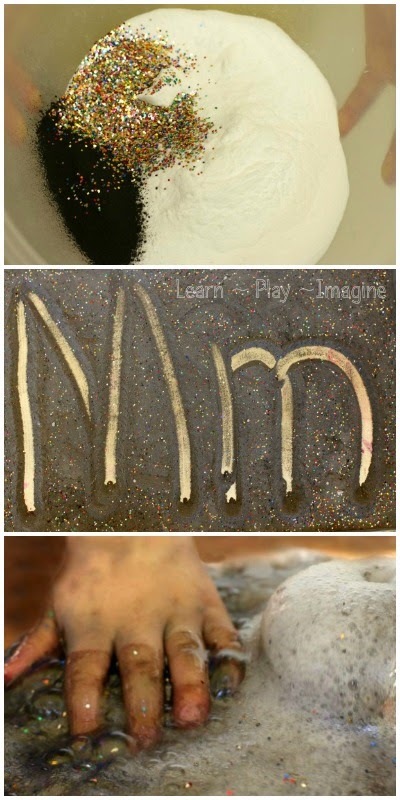 Sensory trays are perfect for preschool and kindergarten as they provide a tactile way to work on letter making. This was a great opportunity for me to watch J-Bug trace letters, and I was able to correct a couple bad habits he had. This prewriting activity is a fun way to learn important skill for kindergarten. In between each letter or word, gently shake the tray to get the moon dust to settle flat again. Before long Tank and Peanut (34 months) joined us at the picnic table and wanted to join in the sensory fun. When they grew tired of the sensory tray I whipped out the squeezy bottles full of vinegar. J-Bug got to make the moon dust on the tray erupt. Before he began I scooped up several small containers full of moon dust and passed them out to the other boys. They thought the sensory tray was exciting, but the erupting moon dust really knocked it out of the park. Peanut and Tank asked for more again and again. 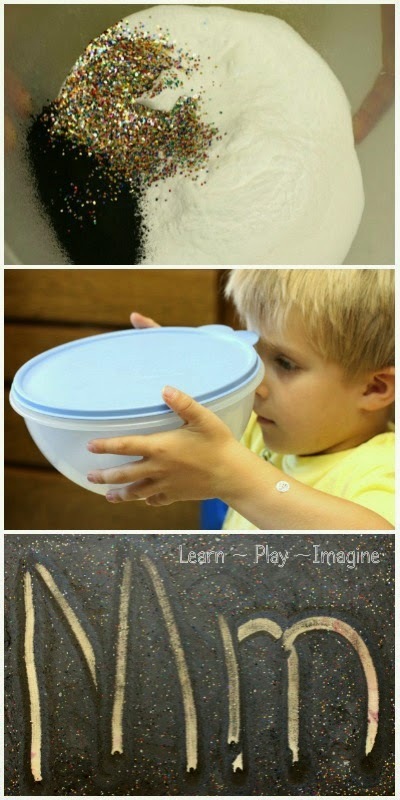 We love erupting recipes for play, and the addition of glitter made this that much more exciting! One thing I wish I would have done is put the moon dust containers in a sensory bin. Everything washed away clean, but there was a giant mess for awhile. Learn from my mistake. It would have been much easier to clean had it been contained. Also, the black powdered tempura will stain little hands for a short while, but by the end of the day they were all clean. Here are tips for messy play as well as laundry tips to avoid stains and keep clothes bright. After all of the moon dust had popped and fizzed we moved all the mess to a sensory bin. (Too little too late - haha!) We added water, and the boys played in the mixture and rinsed all the containers with the hose. For more prewriting activities follow me on Pinterest. I had the same issue. I ended up getting black sand. Hoping for the best.